1986 saw the end of the vacuum braked Class 25s on BR, 25042 was the last such Class 25 in service, being withdrawn in May. In earlier times 25042 is seen here (maybe Haymarket or Millerhill) - in BR Blue/Yellow but still with the gangway doors in place. History would reveal that the declining fleet of Class 25's would all officially be taken out of service during March 1987. A year earlier, back in March 1986 it would have been difficult to predict when the last mileage would be run by the Class 25's. At the beginning of March there were still fifty four Class 25's in service, barely sixteen percent of the original fleet total of 327. This total included the dozen Kingmoor based Class 25/9's, the majority of the remaining Class 25's were allocated to Crewe. The condition of the remaining locomotives left a lot to be desired. Classified repairs had ceased during 1980 when a total of twenty seven received intermediate or general repairs at Derby & Glasgow. The last outshopped by Glasgow were 25062 (general) in June 1980 and 25234 (intermediate) in October. Derby released its last intermediate repair - 25080 during June whilst its last general - 25278 was released to traffic on January 21st 1981. It left Derby Works at the same time as 46011 - the last Class 46 to recieve a classified repair at Derby. Additional to the fifty four Class 25's in service at the beginning of March, there were also many more scattered around the country, either at Works awaiting scrapping, or dumped at numerous depots awaiting the last journey to the Works. By far the two largest concentrations were at Swindon Works and Doncaster Works, the former had over fifty Class 25's on site, whilst the latter had nine awaiting scrapping. Derby held only one - 25200, whilst Glasgow had 25028 & 25318. There were no Class 25's at Crewe Works but the nearby electric depot held withdrawn 25083. 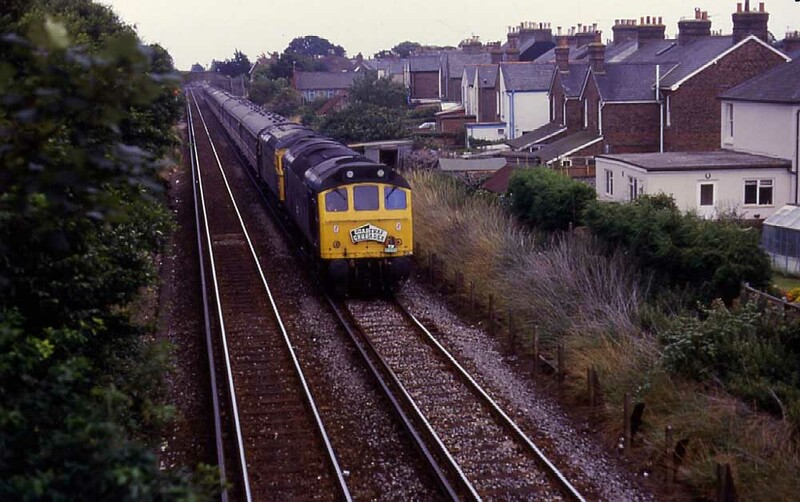 Depots such as Toton, Kingmoor and Crewe also held quantities of withdrawn Class 25's. On March 3rd 25078, 25195, 25257 & 25287 moved as the 9Z34 Toton - Doncaster Works. 25192 had been well travelled in the first quarter of 1986, its last passenger working was assisting a DMU throughout on the 17.42 Carlisle - Newcastle of March 18th. An unusual move was that of 25214 & 25256 from Doncaster Works to Swindon Works (via Gloucester) over March 20th - 24th. Both machines were veterans in their own right. 25214 had been retired in October 1982, it had reached Stratford by December before returning northwards to Healey Mills for further storage - it lingered quite a while here before moving to Doncaster. 25256 was not quite so well travelled as 25214 & prior to its move to Swindon it had only spent about a year in store. However, prior to withdrawal it had operated for ten years and five months since its last classified repair. After two months dumped at Springs Branch 25300 & 25302 continued their slow movement to Doncaster Works by travelling on March 20th across the Pennines to Healey Mills. Also on March 24th 25205 racked up its last passenger mileage, between Nuneaton and St Pancras whilst assisting a diverted Manchester Piccadilly - Euston express. By the end of March six more Class 25's had been withdrawn (25032, 25196, 25206/282/285, 25311), whilst 25176 & 25278 were transferred from Kingmoor to Crewe. More than likely 25190 was the last working example to visit Derby Works, exchanging bogies from withdrawn 25200 - the latter having been received at Derby with extensive power unit damage, repairs were not authorised. 25196 was one of March's casualties, it is seen here a short while later on May 11th at Crewe slowly losing parts to keep its few remaining sisters in service. Its last classified repair had been an intermediate at Derby back in December 1979. Withdrawals in April were limited 25269. The last passenger working for 25202 was on April 10th assisting a Blackburn - Manchester Victoria throughout. Movements included 25044, 25119, 25245/226 from Crewe to Doncaster Works on April 15/16th, with 25044 having started this last journey at Springs Branch and joining the consist at Warrington. 25095 was noted covering three DMU turns on the Bedford - Bletchley branch on April 17th - 25095's last passenger turns. 25119 stands amidst the locomotives that it came with from Crewe, seen here in Doncaster Works on April 27th. By the middle of July 25119 would be no more. When withdrawn in June 1985 25119 had surrendered its power unit to the slightly more fortunate 25057. Swindon reduced its total by three, disposing of 25086, 25248 & 25317 during April, whilst Doncaster finished off 25210 - this was the first Class 25 broken up here since 25015 in 1975. On April 25th Sudbury Yard was host to a derailed 25205. This incident is presumed to have brought about its demise a shortwhile later on May 9th. Three days later on April 28th 25259, on its last passenger haulage, worked the 14.17 Bangor - Cardiff forward from Crewe after 33051 failed. A further five class 25's were withdrawn, 25042, 25192 & 25211 from Crewe and 25205 from Kingmoor. 25042 was the last vacuum braked Class 25 in service, being withdrawn in full working order. The last Class 25 transfers took place in May when 25191/199/201/202/259 were moved from Kingmoor to Crewe. All the class 25's were now at Crewe apart for the dozen Class 25/9's at Kingmoor. These final transfers had been made possible by some Class 31 wreckage being transferred from Cricklewood & Bescot to Kingmoor. 25177 & 25270 were broken up at Swindon and 25237 at Doncaster. All was not bad news however, the Class 25's could certainly draw a crowd when diagrammed for railtours, and although their reliability was suspect they still had a number of railtours to cover. On May 5th 25057 & 25109 were diagrammed for F&W's 'Valley Explorer' which started at Crewe with the ultimate destination of Margam via Birmingham, Bristol Parkway, Cardiff & Barry Island. The journey was interrupted at Barry Island north due to a points failure, requiring 47242 to drag the train back to Cardiff where the 25's continued to Margam. At Margam the Class 25's gave way to 37237 for a roundtrip to Swansea & Onllwyn. On the return to Margam it was left for 25057 & 25109 to return over the familiar NE/SW route to Birmingham, then Stafford, Stoke & Crewe. The only retirement during June was 25202. Broken up were 25069 at Swindon and 25189 & 25210 at Doncaster. On June 7th Traintours 'Welsh Thunderer', from Stalybridge to Pwllheli, was booked for 40122, however a broken cab window on the Class 40 found 25288 piloting the journey throughout. The pair worked through to Pwllheli, here they were used on the regular service train to Porthmadog, then the through service to Euston as far as Shrewsbury. Here 40122 & 25288 returned to the railtour, which had been brought back from Pwllheli by 37426 & 37428. The CRSL/WSAG 'Edinburgh Flyer' Caersws - Edinburgh on June 29th 1986 used 25266 & 25313 on the Caersws - Chester and return Chester - Shrewsbury legs. Unfortunately on the return one of the Class 25's suffered brake problems approaching Shrewsbury, such was the severity of the failure the train was terminated at Shrewsbury, a Sprinter having to complete the journey! During July 25095 & 25244 were withdrawn. Doncaster broke up 25044 & 25119 whilst Swindon finished off 25135. When 47447 failed on July 3rd at Chester with a Llandudno Town - Stoke 25321 & 25249 were on hand, taking the train forward to Blythe Bridge, this was 25321's last passenger working. 25109's last passenger haulage took place on July 27th, and involved the 12.52 Liverpool - Hull and 19.23 return, a total of 268 miles of passenger haulage - no doubt deputising for a failed eth equipped locomotive. This day also proved to be the last day in service for 25181, which coincidentally was working F&W's 'Coastway Crusader, a railtour with 25191 from Wolverhampton with the Type 2's working from Bristol to a variety of points on the Southern Region. The locomotive failed at Ludgershall, suffered severe wheel flats, was dragged to Eastleigh, withdrawn, festered for a while before leaving the Southern Region as just so much scrap on a Vic Berry lorry bound for Leicester. Photograph courtesy Paul Garvey The back yards of Chichester provide the unusual backdrop for 25191 & 33011 as they work the 'Coastway Crusader' - see above for details. Was this the last Class 25 to visit any Southern Region metals? The next day, July 28th, 25230 was diagrammed for the 08.45 Liverpool - Sheffield - it got as far as Castlefield Jct prior to failing, an unfortunate event on its last passenger working, 47142 took the Class 25 and its train on to Sheffield. Another two Class 25's bit the dust - 25181 & 25230. Broken up were 25076 at Swindon and 25226 & 25245 at Doncaster. The 06.30 Wolverhampton - Shrewsbury used 25191 on August 12th, its last passenger working. F&W's 'Snowdonian II' tour on August 24th started at Paddington, heading to Bristol, Birmingham & Shrewsbury where 25037 & 25201 were waiting for the run to Pwllehi and back. 25057's last passenger working was on August 29th when assisting ailing EMU 304045 between Kidsgrove and Stafford. This was also the day for 25265's last passenger haulage, again not much mileage when it assisted 86214 and the 18.00 Holyhead - Birmingham New Street forward from Sandwell and Dudley into New Street. For the last time in a seven day period (August 24th - 30th) it had been possible to capture Class 25's each day on passenger haulage, albeit including a railtour and a football special. All were basically concentrated in Birmingham and the North West. A familiar location at Greenholme as 25909 & 25905 head north with a ballast train on July 31st. Because Kingmoor drivers had traction knowledge of the Class 25's to the end, they remained frequent visitors to Scotland. Seen here on August 16th is 25910/903 and 26015 at Motherwell. The end of the summer timetable saw eight Class 25's withdrawn (25254/259/266/321 & 25905/907/909/911) bringing the operational total to just twenty nine. The numbers being broken up also increased with Swindon dealing with 25136/140, 25214/239 and Doncaster with 25054 & 25229. Doncaster were about to cease their cutting up activities resulting in 25060/78/195/257/287 being moved from the Works to temporary storage at Goole. 25194 was noted being moved from Shrewsbury to Bescot for defuelling, whilst Etches Park had become the temporary home for withdrawn 25202. 25901 came to the rescue of an ailing 45114 at Rainhill whilst working the 20.44 Liverpool - York, the 25901 dragged the train to Manchester Victoria, this was the last passenger haulage for 25901. The last passenger haulage of any consequence for 25176 was on September 24th when it covered the Preston - Manchester leg of the 18.20 ex Glasgow, although on November 21st 25176 assisted an EMU the very short difference (less than a mile) from Denbigh Hall Jct to Bletchley. On September 28th 25190 dragged three electric services between Glasgow Central and Shields Road due to the power being off, these were 25190's last passenger workings. Further south history was in the making as four Class 25's took part in the last Class 25 Railtour as 25249 & 25313 and 25904 & 25910 were utilised on the 'Mersey Ratcatcher' on a round trip Euston to Liverpool working, with 25249 & 25313 covering the greater part of the tour with the Class 25/9's in use between Liverpool and Crewe. This would prove to be 25910's last passenger haulage. Five years after withdrawal 25259 heads a line up of Class 25's at Bescot (25259, 25205, 25206 & 25194) - seen here in 1991. The considerable withdrawals in September were not duplicated in October, only 25906 was retired. With Doncaster no longer cutting up withdrawn stock and Swindon not accepting any further withdrawn locomotives the movement of withdrawn class 25's ceased temporarily. 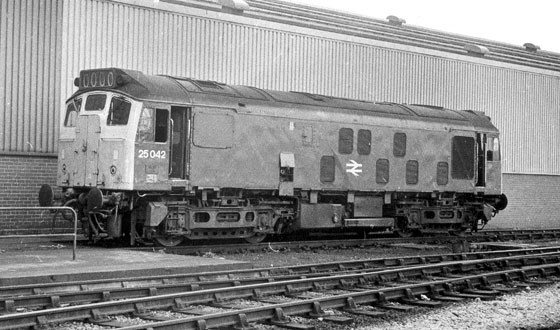 During October Swindon cut up 25139/251/256/284, whilst Derby Works still contained the withdrawn 25200, the last visible sign of Derby's connection with the BR/Sulzer Type 2's. On October 13th the DMU working the 18.52 Carlisle - Sunderland was assisted to Newcastle by 25037 where the service was terminated - this was the last passenger working for 25037. In the same week on October 19th 25034 also worked its last passenger service being the 09.35 Edinburgh - Poole as far as Glasgow. This week also saw 25288 finish its passenger haulage, between 11th & 21st it worked several trains over the Settle & Carlisle, possibly as a pilot locomotive due to engineering works. Right at the end of October the locomotives temporarily stored at Goole, including the five Class 25's (25060/78, 25195, 25257/287), were moved south via Tinsley to Leicester. This marked a major change in the process for disposing of withdrawn locomotives. Whereas previously the BREL Workshops had bourne the brunt of the scrapping process with occasional sales to private scrapyards, the reverse would now be true, with in some cases the private scrappers coming to the Works to clear out the withdrawn locomotives. Principal player in this process was that of Vic Berry, Leicester who was instrumental in assisting Derby, Glasgow & Swindon with the clearance of their scrap locomotives. Like October the withdrawals in November were slow - just 25908. Cutting at Swindon had also slowed down, only 25138 & 25236 were disposed of. After its epic journey as part of the 'Mersey Ratcatcher' railtour late in September, 25249's final passenger working was much more humble. On November 1st it came to the rescue of 47555 on the 09.48 Crewe - Holyhead, providing assistance between Prestatyn & Colwyn Bay. The same day 25303 recorded its last passenger haulage, a late evening drag of a WCML electric service between Wigan NW & Preston. 25173 ended its passenger haulage on November 3rd providing a late evening relief service between Preston & Wigan NW. 25279 also finished its passenger haulage in this area, handling November 18th's 18.20 Glasgow Central - Manchester Victoria forward from Preston. The third week of November was a busy time for 25323, on 20th it worked a Dundee - Montrose round trip covering for a failed DMU. On 24th it rescued 47412 at Dumfries with the 10.55 Carlisle - Glasgow, picking up the return 15.45 to Carlisle, double headed with 27008, this was 25323's last passenger working. During December only 25034 was withdrawn, leaving just twenty six in service as the year ended. 25104/124/221 were disposed of at Swindon, there were now just thirty one Class 25's remaining here. Those machines which had been sent to Vic Berry's were still extant, the scrapper initially concentrating on the Peaks which had arrived from several locations. Elsewhere a number of locations had slowly been accumulating withdrawn Class 25's; Carlisle had seven on hand, Bescot held six, Springs Branch had three, Crewe and Toton of course still held many. With the New Year came more withdrawals, taken out of service during January were 25037, 25190, 25201/249. Another local working for 25173 on January 8th at Manchester Victoria - later this day it would be off to Bangor. This would probably be one of the last Class 25's to visit the Willesden area. Swindon cut up four more Type 2's - 25130/141/186/187 during January. Having ploughed his way through the Peaks received at his yard, Vic Berry set about cutting up the Class 25's on hand, the first to go was 25195 followed by 25257. The activity here would rapidly increase as the flow of locomotives from across the country started to make their way towards Leicester. During January Crewe dispatched nine locomotives in two separate movements, whilst the clear out of Derby Works included the last 25 present - 25200. A brief passenger service - its last - for 25201 was assisting a late afternoon Kidderminster - New Street DMU forward from Stourbridge Jct on January 5th. The next day the 07.22 Aberystwyth - Euston failed at Caersws, 25278 was on hand to take the train forward, unfortunately on its last passenger working it expired at Shrewsbury! 25037 had experienced a loss of power on January 8th, Crewe rectified this but by 11th the engine shut down unexpectedly at Northampton - it would not run again, by the 19th it had arrived at Crewe, withdrawn. 25064, 25198, 25224 & 25269 moved from Crewe to Leicester January 9th - 12th 1987. The last passenger working for 25902 (double headed with 25192) came on January 15th when it came to the assistance of a Chester - Manchester Victoria DMU at Warrington. 25058 was operating over its old haunts on January 16th, having to assist 47539 from Dumfries to Glasgow on the 13.55 from Carlisle - 25058's last passenger haulage. Another Class 47 failure, that of 47449 at Leicester on January 20th's 22.54 Nottingham - St Pancras allowed 25059 to work up to St Pancras, it came back north on the following morning's 1P03 St Pancras - Derby from Cricklewood following the failure of clunker 31423, this was 25059's last passenger working. Its January 16th 1987 and 25201 has been diagrammed for the Nuneaton Hartshill turn. Unfortunately the weather has taken a turn for the worse and a heavy snowfall has created a different panorama for the yard. Even worse the weather has caused the ground frame to freeze up trapping the locomotive and its train in the yard. It will finally be towed out of the yard a couple of days later. Moved from Derby Works by 47199 on January 19th were 25200, 40075, 45057 & 45117, they finally reached Vic Berry's yard on January 27th. On January 23rd Crewe sent 25048, 25145, 25175, 25231 & 25303 over to Leicester, arriving at Vic Berry's yard by January 26th. In a move to rid the Scottish Region of its scrap locomotives (including 25028/318 at Glasgow & 25046/160 at Polmadie), a scrapping point was established at Thornton Jct by Vic Berry with a variety of condemned Class 08/25/26/27's being sent here towards then end of January. All four of Scotland's withdrawn Class 25's were moved to Thornton for breaking. After discovery of asbestos in the Class 26/27's cut up there, scrapping was stopped and the locomotives were dragged down to Leicester for disposal. After workings out of Toton & Bedford 25201 was noted stopped at Bletchley with loss of power on January 26th - the locomotive was moved to Crewe on January 29th and withdrawn that afternoon. January 27th is believed to be the last day that two or more Class 25's were noted on passenger workings on the same day, and both were good hauls - 25213 on the 07.22 Aberystwyth - Euston as far as Shrewsbury and 25313 assisting 47476 on the 15.16 Llandudno Town - York forward from Chester to York! After several workings in the Llandudno area 25190 was stopped at Crewe on January 27th for an 'A' exam and coolant leaks. These were never completed, 25190 was retired this day. 25249 also ended stopped at Crewe this day with low power problems, it too was retired on 27th. 25278 drifts up Shap at Hayfell on January 30th. By February 1st it was at Nottingham arriving on the 1M65 22.37 ex Glasgow, diagrammed north with the 1E94 to Sheffield (did it work it?). 25285's last passenger working was on February 2nd, hauling the 13.40 Crewe - Cardiff throughout. Five days later on February 7th it was the turn of 25296 to end its passenger haulage with the Preston - Blackpool leg of the 22.47 ex-Crewe. 25058 & 25199 were withdrawn during February, leaving just twenty one active Class 25's. 25058 was taken out of service at Crewe on February 2nd after having spent much of the previous month north of the border on a variety of workings. 25199 appears to have been withdrawn two days after 25058, reaching Crewe (from Bescot?) on February 9th. Crewe received 25288 on February 17th for investigation of loss of power, repairs were not forthcoming and the locomotive taken out of service on February 19th. Swindon's stock of Class 25's was now down to twenty two following the breaking up of 25153/179/188 & 25219. Vic Berry continued its scrapping of the Class 25's during February with 25198, 25200/224/257/287 dealt with. During March the decree came down that all remaining Class 25's were to be taken out of service. Although the time constraints laid down in the instruction were not precisely met, nevertheless by the fourth week of March all the remaining nineteen operational machines had been silenced. For those final machines the last resting place was generally Crewe, however 25213, 25901 & 25903 all ended their days switched off at Carlisle. Although the final days of the Class 25's found them generally operating west of the Pennines between Crewe & Carlisle, a number of them did make diversions just a little off the beaten track. A number of them worked over the Cambrian lines - 25057 worked the Stanlow -Aberystwyth tanks on March 3rd, whilst 25059 was at Machynlleth on March 3rd. 25109 appears to have been very active on this route between March 1st & 9th, even putting in a visit to Pwllheli on March 8th! Possibly the last active Class 25 over the NE/SW route south of Birmingham was 25904 on March 17th's Sellafield - Bridgwater spent fuels train, working to Gloucester. Likewise on the Holyhead route it was left for 25265 to be the last Class 25 to visit Holyhead, being noted there on March 17th. North of the border the Class 25's remained frequent visitors to Ayr, Motherwell & Mossend. 25173 had been at Ayr on 5th, 6th & 8th, 25278 was so noted on 3rd & 6th, possibly having arrived from Stranraer on the former date. The well travelled 25059 was noted at Bathgate and Motherwell on 16th whilst 25910 had possibly reached Mossend on the 6S81 ex Tyne Yard on 3rd. The final passenger action for 25213 occurred on March 7th providing assistance for a Lancaster - Leeds DMU from Carnforth. On the weekend of the intended withdrawal of the Class 25's, withdrawn 25051 made a long journey from Carlisle to Leicester via Warrington, Crewe, Bescot & Toton. It was received by Vic Berry's for scrapping, but was to have its bogies returned for further use under 97252, now based at Marylebone. Swindon cut up 25157 during March. 25323 left Saltley on 3rd with the 3V10 to Bristol, it was taken off at Gloucester, being noted here with traction motor problems. It was towed back to Saltley on 7th, then to Crewe on 8th and was withdrawn the following day. 25902 had arrived at Wigan on February 28th for the possibility of completing an 'A' exam. This appears not to have been completed as it was sent down to Crewe on March 3rd and withdrawn. After several days working in the Liverpool & Manchester areas 25176 was taken out of service at Longsight during the morning of 6th to allow for the investigation of valve and rocker gear repairs. These were not forthcoming and the locomotive withdrawn. 25109 survived an 'A' exam at Crewe on March 5th, shortly afterwards it made it out to Machynlleth (& Pwllheli? ), but was taken out of service at Crewe on 11th. Its 12.25pm on March 11th as 25278 drifts through Crewe station with a train for Stoke. Possibly the last working for 25278 was on the afternoon of March 17th working a roundtrip Basford Hall - Chester job (8L76). Upon its return to Crewe Depot that evening it was retired. Ellesmere Port, March 12th 1987: 25901 is in charge of the 7T74 Ellesmere Port - Arpley tank train. Just four more days of service remain for 25901. 25313 came to the rescue of March 13th's 07.07 Newcastle - Liverpool at Manchester Victoria when 47532 failed - the Class 25 finishing the journey to Liverpool. This day saw the last recorded passenger working of a Class 25 when 25035 assisted 47424 between Chester & Crewe on the 07.09 Holyhead - Cardiff. 25279 at Springs Branch on a damp March 14th 1987. 25279 was diagrammed to work to Crewe Gresty Lane on March 15th but it may not have worked this job, instead making its last move to Crewe for immediate withdrawal. After the final passenger working the day before, 25035 was retired during this afternoon and moved to Basford Hall. Another casualty this day was 25057, also being moved out to Basford Hall. Crewe Depot sent withdrawn 25109 down to Basford Hall for storage. The Wigan area saw the last activity of 25279 on 15th, after its last working it was stored at Springs Branch unserviceable. It reached Crewe on 16th and was promptly withdrawn. 25901 was retired at Carlisle during the early hours of 16th. 25903 had been diagrammed for 16th's 02.30 Crewe - Barrow, going forward to Carlisle. Here it was taken out of service on 17th, being stored unserviceable, then next day it was withdrawn, remaining at Carlisle. Local workings in the Carlisle area for 25213 ended late on the 17th when it was taken out of service at Carlisle, one of several of the final few Class 25's not to be retired at Crewe. A Crewe - Chester round trip proved to be the last working for 25278, it was withdrawn later that night. After working south from Carlisle on 16th 25059 had reached Buxton depot on the morning of 18th, where it would be taken out of service. In the Crewe area 25191 had been on local working, coming back to the depot in the early afternoon it was taken out of service! The last Class 25 at Holyhead - 25265 - reached Crewe on 16th but was not retired until 18th. After much working in the Manchester area 25313 was sent down to Crewe on 18th and withdrawn from service. Also withdrawn that evening at Crewe was 25910. A round trip Guide Bridge - Nuneaton Hartshill appears to have been the last working for 25173 on 18th - it reached Crewe on 19th and was taken out of service this day. The Chester area saw the final workings of 25904 on 21st - it would reach Crewe early on 23rd where it was quickly taken out of service. The last working of ice cream van 25912 was on the morning of 23rd with a Bescot - Basford Hall freight, by early afternoon it was at Crewe Depot, withdrawn. These highlights do not reflect the later use of the Holbeck Training Locomotive & and in light of all the detail on this page I'm sure there are errors in the text, possibly also some of the stated 'last passenger workings' may not be the case if you know different. With thanks to Alan Baylis & Neil Cannon for much of the detailed passenger & TOPS information.